House l'Faust is an old, old house, among the eldest in Creation's Edge. While the other great houses of the North can trace their lineage back to the earliest days of the Kingdom of Couviere, the l'Fausts can boast a still older lineage, one that stretches back to the Etharian Empire. While records stretching back into the early days of the Imperial Colonies are sketchy at best, the l'Fausts claim an unbroken line of descent from Marius Faustus, who in turn claimed to be a natural-born son of Tiberias Castor, brother to the Emperor Marcus II. It is known that Marius was an administrator of some skill who came to the Imperial Colonies around the year 800 IA and, within a decade, was a fairly high-ranking official in the province of Ostvor. His sons proved to be capable leaders as well, and his grandsons more able still, such that within a few generations, the Fausti were firmly entrenched as both military and civilian leaders throughout the province. Most of the next few centuries of the family's history have been lost to time, but it is known that the provincial governor as 1357 IA was a man named Paul Faustus. As the Empire completed its withdrawal from the Edge, Paul took it upon himself to maintain order in the province, training and equipping his own men-at-arms drawn from the local populace to replace the departing Imperial soldiers. While many scholars argue that his motivations for doing so were not entirely altruistic, in the ensuing generations, the l'Fausts have made much of their ancestor's dedication to the region and its people, claiming that he turned down a position of great power and prestige across the mountains to remain in Ostvor. Soon after the Empire completed its withdrawal, Paul Faustus declared himself the independent Duke of Ostvor, ennobling several of his key advisors to lay the foundations of the longstanding houses of the province and officially founding House l'Faust. With a strong bureaucracy already in place and an advantageous location with few strategic threats except for the scattered Myrned barbarians, Ostvor made the transition out of Imperial rule remarkably well, growing and prospering in those early years. Indeed, had Paul l'Faust held ambitions beyond his borders, it could well have been he, not Artus l'Valdan, who founded a kingdom in the North. However, the Duke of Ostvor was content to watch with interest the events happening to the west, and he maintained a policy of stubborn neutrality to the end of his days. As it turned out, he lived for a remarkably long time. At the time of his departure, the first Duke of Ostvor had outlived both his counterpart to the west, the now-King Artus l'Valdan, and all of his own sons. It was Paul's grandson Osric who completed negotiations with Artus' son and heir to bring Ostvor into the young Kingdom of Couviere. As the l'Valdans pursued their policy of building and strengthening infrastructure, it was the overflowing coffers of Ostvor that funded the projects. The Kings of Couviere, in turn, provided additional stability and security for the province, cementing the loyalty of the l'Fausts toward their new lieges for generations to come. Over the centuries, the l'Fausts emerged as a moderating influence between the zealous l'Corren and the pragmatic l'Saigner, and more often than not, the position of Archduke of Couviere was held by the Duke of Ostvor. The Lightning Brigade, a unit of elite cavalry created by Osric to defend the Kingdom against its foes on all sides, came to prominence when it rode to battle Tirian and Brodlund forces far to the west of Ostvor, gaining a reputation for always appearing at the right moment to turn the tide of a conflict. The l'Fausts were relatively minor participants in the Northern Crusades; some devout members of the house fought of their own accord, but the Dukes of Ostvor, for the most part, sent only token forces north, leaving the brunt of the fighting to the l'Corren and the Knightly Orders. The Thirty Years' War, however, placed the l'Fausts in the unfamiliar position of being on the front lines of a major armed conflict, and their people suffered mightily during Bryar's March. It was the great fortune of the house that the Haldis general chose to avoid besieging Ostvor itself, choosing to focus on smaller towns and cities. Still, a great many young men perished, and House l'Faust itself lost many of its most talented members in the fighting. Nevertheless, thanks to the still-lucrative trade that flows through the East as well as the steady leadership of Archduke Manfred, the l'Fausts have recovered well from the devastation of the war. They remain the Kingdom's only link to the Etharian Empire, they retain, for the most part, the trust of their people, and they are yet skilled both in warfare and politics. Difficult times may be coming for Couviere, but House l'Faust has given every indication that it will be able to weather the storm. The l'Fausts played no small role in the events surrounding the Cardinal's Gambit. As Couviere's only link to the East, they were instrumental in investigating the attack of the False Imperials and revealing them for the sham they were, not actual invaders from the Etharian Empire. Cardinal Ramius attempted to harry the l'Fausts by arming the Myrned tribes and otherwise putting pressure on their trade routes, but ultimately, Ostvor was too strong and stable for his forces to make many inroads. Forces from House l'Faust supported Crown Prince Jean-Paul at the Battle of Three Crowns, and the Lightning Brigade was involved in a number of engagements throughout Couviere. The Lightning Brigade: The riders of the Lightning Brigade are the elite cavalry of House l'Faust. Though the Brigade cannot match the sheer strength of forces such as the Blue Cavaliers of House l'Valdan or the Argent Legion of House l'Corren, they fight with unparalleled versatility. The Brigadiers are skilled with both melee and ranged weapons and are renowned throughout Couviere for their ability to arrive at engagements almost before they begin. Men at Arms: In keeping with their closeness to the Etharian Empire, the professional soldiers of House l'Faust fight with tremendous discipline, specializing in spears and formation tactics. They are well-trained, skilled warriors, but their true strength is in their equipment - the best weapons and armor that the rather wealthy l'Fausts can afford. Levies: When the l'Fausts call their men to war, most of those who heed that call are farmers, and their martial skills are nothing more than one might expect. Those who come from the outlying lands in close proximity to the Vorlonian Mountains, however, have experience fighting off Myrned raiders. These men tend to be a cut above the other militia and are particularly difficult to surprise. Mercenaries: Given the amount of trade that flows through their lands, the l'Fausts have access to a number of sellswords and mercenary companies as well as the funds to take advantage of their services. Mercenary companies of the East tend to disperse during peacetime, finding employment as caravan guards and bandit hunters. During wartime, however, they often find themselves in the service of the Dukes of Ostvor. In terms of sheer capital, the l'Fausts are the wealthiest house in Couviere. The l'Valdans are well outstripped, and the l'Saigner can only compete if that house's under-the-table resources are in play. Some lower houses may be richer in proportion to their size, but none can match the l'Fausts' combination of territory and prosperity. Their primary source of revenue is the trade that flows through their lands to and from the Etharian Empire. Merchants in and around Ostvor trade in a broad range of exotic goods, and their lords take a healthy share of the profit to fill their own coffers. Nearly as vital to the l'Fausts' continued prosperity is Ostvor's status as the breadbasket of Couviere. The lands of the East are some of the most fertile in all Creation's Edge, and the temperate climate is ideal for maximizing crop yields. In addition to the revenue provided by grain exports, the fertility of the land gives Ostvor a larger than average common population - which, in turn, leads to more income through taxes. Forward-Thinking - Members of House l'Faust are taught from a young age to consider the long-term implications of their actions. Their knack for advance planning is almost uncanny. Shrewd - By the time they reach adulthood, most l'Fausts have witnessed hundreds of business deals and participated in more than a few. It's no wonder that they are among the most shrewd merchants and dealmakers in the Edge. Worldly - As befits their tendency to travel far and wide, the l'Fausts tend to be in touch with the world beyond their borders. They aren't necessarily better educated or more knowledgeable than others, but they have a knack for knowing the right thing at the right time. Head for Numbers - The l'Fausts haven't become one of the wealthiest houses in the Edge by mismanaging their resources. Not every member of the house is a gifted steward, but enough of them are that the house as a whole has more than its share of talent. Well-Traveled - Travel and trade are the l'Fausts' bread and butter, and it does help that they have the means as well as the inclination to travel very far afield. It's not unusual for members of the House to have traveled extensively in the Edge and beyond. Enigma - Taken as a whole, the l'Fausts aren't exactly a mystery - they're one of the oldest houses in the Edge, after all - but they are a little eccentric. It's not uncommon for members of the house to take that eccentricity and wear it like armor, keeping others guessing. Popular - Given their propensity for trade and travel, the l'Fausts find themselves rubbing shoulders with commoners more often than most among the higher nobility. They maintain good relationships with their people, and many of their members enjoy a higher degree of respect as a consequence. Well-Equipped - One of the benefits of controlling the only reliable route to the East is that the l'Fausts have the right of first refusal on any goods coming in over the border. Needless to say, they generally keep the best for themselves. Inheritance: Eldest legitimate child inherits regardless of gender. Note that this is a relatively recent development, as the l'Fausts practiced male-preference succession until just a few generations ago. It's recent enough, in fact, that it has not yet been tested, as every heir since the change has happened to be male. Nobles: On the whole, members of House l'Faust tend to be honorable and fair-minded, but their code of honor has its limits: the family's precarious position on the border of the Etharian Empire has bred a strong strain of pragmatism as well. Many skilled diplomats and negotiatiors have come from this family, given their background as traders and deal-makers. The house also boasts more than its share of talented stewards, and it is not at all uncommon for the Royal Steward of Couviere to be an l'Faust. Because of their emphasis on trade and travel, the l'Fausts embody a fairly broad range of religious, social and political views. It's not unusual for a scion of the family to become a devout knight with a strict code of honor (and indeed, able-bodied men are expected to at least make a token effort toward achieving knighthood), but agnostics, underhanded negotiators and even spies are just as commonly seen within the family. What binds them all together is a common thread of dignity; the l'Fausts take their position as one of the oldest houses in the Edge seriously. Even those inclined to less honorable methods do so with impeccable politeness and the appearance of courtesy. The most succesful Dukes of Ostvor are those who embrace the variety within the family, putting each man and woman to work in a manner that befits their unique talents and smoothing over disputes by reminding all that they work toward common purposes. Less successful are those who lean either too traditional or too pragmatic, as they find plenty of opposition within their own House. Commoners: Ostvor is a wealthy duchy, and while most of that wealth is in the hands of nobles, merchants and clergy, enough of it trickles down to the common folk that they can live comfortably. If nothing else, having enough to eat is rarely an issue in the East. The l'Fausts have watched over this land for centuries, and for the most part they can depend on the loyalty of their people. As regards outsiders, the commoners of Ostvor tend to subconsciously mimic the dignity of their lords; their land has been settled for longer than any other in Creation's Edge, after all, and there's just a hint of elitism among them in light of that fact. Religion: The l'Fausts have perhaps the most complex relationship with the One Faith of any of the houses of Couviere. Theirs is neither the fierce devotion of the l'Corren, nor the agnosticism of the l'Saigner. Oh, the Dukes of Ostvor are faithful, but their view on the faith is ecumenical - a position of necessity, perhaps, given their proximity to the Empire, but also one strongly upheld by the leaders of the family from generation to generation. Rumor has it that the original l'Fausts were among those displeased by the Church's move to Sanctum in ages past, and whether that is true or not, they are certainly pleased by their position far from the High Priest's eyes in the present. Their theologians are among the most talented in the Kingdom, but also the most likely to present challenges to orthodox doctrine. This makes for a sometimes frosty relationship with Sanctum - most High Priests understand the value of some loyal dissention within the Church, and they allow debates to proceed to a point. More than one reactionary High Priest, however, has come perilously close to condemning that heterodoxy as outright heresy. At any rate, the l'Fausts tend to be simultaneously open-minded and narrow-minded on matters of faith. They are open to a wide range of interpretations on the Faith of the One, including local customs and legends as well as the Eastern Faith - to the extent that such things can be known, of course. On the other hand, they are as harsh when dealing with worshippers of the Many as any other house in Couviere, and perhaps harsher than some, owing to their rather antagonistic relationship with the Myrned tribes. Eccentrics of the East: Since the Etharian Empire's withdrawal centuries ago, Ostvor has been its only link to the Civilized West, and thus the l'Fausts are the only great house with a direct tie to the Empire in the form of a noble liasion. In reality, even the l'Fausts know relatively little about current affairs in the Empire, as the liasions have been notoriously tight-lipped over the centuries. That doesn't stop the occasional rumormonger from whispering that their loyalties are divided, even if those rumors have never been shown to have substance (and, in truth, most dismiss them as nonsense). While few have serious doubts about their loyalty to the crown, many people consider the l'Fausts to be a little… odd. Their customs are strange and old-fashioned. Their relative closeness with the Empire is perplexing. They deal in exotic goods with questionable provenance, if only because so little is known about anything that comes out of Etharia. As one of the oldest houses in the Edge, and one of the most powerful, they are due a good deal of respect, but that respect is occasionally given at arm's length. Silver Spoon: The l'Fausts are wealthy, fantastically wealthy, and while they aren't exactly the sort to flaunt it, they make their riches obvious enough in their dealings with others. Overt shows of generosity to the common folk are commonplace in Ostvor, and they do generally work as desired. When it comes to hosting weddings, feasts and tourneys, the l'Fausts spare no expense, and they'll often even pay for part or all of the wedding for family members who marry out as a means of sweetening a marriage contract with a poorer House. Their displays of wealth tend toward the ornate yet practical - a sword with a gold-plated hilt is no less deadly, for instance, and brightly lit halls with stained-glass windows are both impressive and difficult for enemy spies to infiltrate. The Myrned Horde: While the Myrned tribes are today a scattered and often fractious people, no more than a minor nuisance to Creation's Edge, legend has it that it was not always so. At one point in the early history of Couviere, perhaps even before the Kingdom was properly founded, a great horde of several united tribes descended on Ostvor and laid siege to the city, only withdrawing when a great hero defeated their leader in single combat. 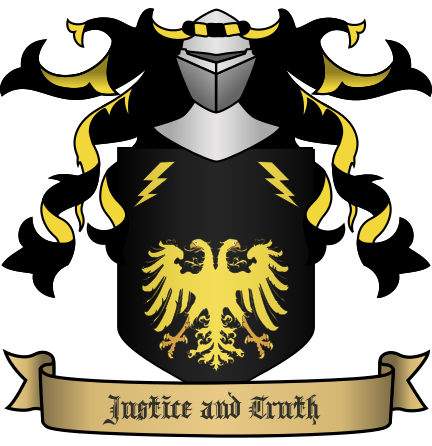 The identity of the warrior in question is disputed and changes from telling to telling - Osric l'Faust is the most commonly given name, but the champion is also said to be a relative, a member of a lesser house, or occasionally even a commoner. That is, of course, if the legendary duel ever happened at all. Gideon's Excursion: Given that the l'Fausts are known for travel, trade, and riches, it is no surprise that one of their most commonly told legends revolves around all three. Gideon l'Faust, brother to a Duke of Ostvor centuries ago and a man of fantastic wealth, is said to have traveled far south, to the Alhazred Empire, and spent so lavishly during his time there that the local economy was ruined for a generation - the telling varies, but one of the most commonly sung verses claims that gold was so easily found that a double handful of coins would buy only a loaf of bread. Scholars generally agree that Gideon did exist and that he did travel to the Empire, but the actual impact of his famous journey is disputed. When l'Fausts marry, it is customary for the groom to carry the bride over the threshold to their new home (or through the doorway to their quarters in Ostvor, if the groom does not have a separate house of his own). Allowing any part of the bride's body to touch the ground is considered a poor omen for the marriage. This custom has spread to other parts of Couviere (as l'Fausts who marry out will often insist upon it) as well as to the lesser houses of Ostvor, but the l'Fausts practice it every time. True love marriages are uncommon for the l'Fausts (as with most noble families in Couviere), but the house does, as a general rule, prioritize compatibility between the new bride and groom more highly than most houses. It is quite common for the l'Fausts to insist that the bride- and groom-to-be meet before the wedding, and the Head of House (or a trusted relative or servant) will carefully vet the potential new addition to assess the likelihood of a successful match. This sometimes extends even to the point of making a less politically advantageous match in the interest of ensuring a more stable marriage. Note that this isn't entirely altruistic on the l'Fausts' part: their view is that content and satisfied individuals will make stronger contributions to the House as a whole over time. Still, it does tend to work out well for members of the family. Of course, individual Heads of House may weight their criteria differently, and changing circumstances can necessitate less ideal matches, so this is more a guideline than a hard and fast rule.